Firstly, in a ligation mix the plasmids must be heteroduplex. In a PCR round double stranded DNA forms at 72°C and denatures at 95°C. However in the last step, the longer 72°C step all single molecules find their complement. However in the case of sequences with a few mutations any complement will do. 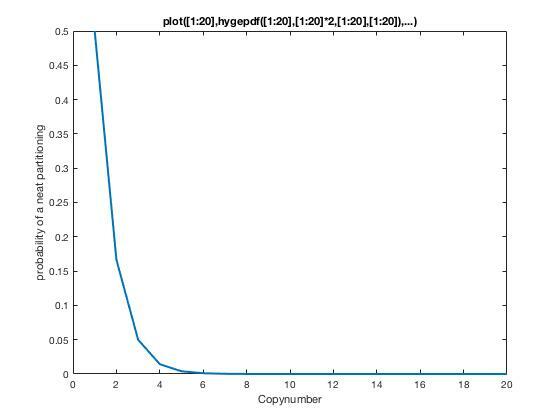 That is to say all sequences at the end of an error prone PCR reaction are heteroduplexes —on an amplification plot of a qPCR few amplifications happens in the the last few cycles and there the DNA template is diluted more than in epPCR. An old paper from 1989 (link) looks into what happens when one transforms a heteroduplex. Mismatch repair fixes the issue 70-80% of the time, while in 20% the plasmid duplicates into a mixed population. Assuming that a heteroduplex survives DNA mismatch repair, the two plasmids will not part ways. After transformation the 50 µl of OD 100 exponential phase cells (OD 5) are grown in 1 ml SOC for an hour or two. SOC supports an OD of 4 per ml, so there is enough food for a single duplication at best, but then the copy number of a plasmid is 20 or so. 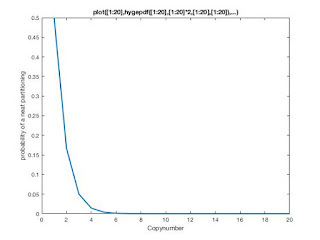 The chance of picking 10 plasmids of all the same kind in a 50/50 of 20 plasmids is, using the pdf of a hypergeometric distribution, is 5e-6 (see figure), so pretty much impossible. In a dividing cell there is probably 2x 20 or something like that, but the maths is equally dire. However, the maths does not fully fit. If no cells die, the numbers should be 50/50 and even if cells die (ghosts) or get stuck (zombies or eels) rather easily the chances are relatively small I would guess. The best way is to do simulation, but some assumptions may be wrong. 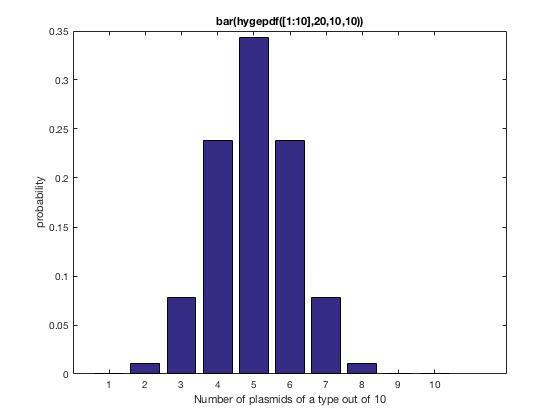 My guess is that a mixed plasmid is not overly perturbed by amplification of a cell to 5 ml LB (5e9 CFU). However 1 in 5 mutations in a sequence are not a mix. Actually the ones that could be a mix are ambiguous and is more of a 1 in 10 event (if even) and the proportion is not a 50/50. Nevertheless, this seems, on paper, to be a legitimate thing. On the flipside the cells that repair the heteroduplex would suggest that a DNA shuffle of sorts between two actually happens in vivo, which is a good thing if the number of amplifications was high as some combinations of mutations will be over represented. In a subsequent post I do an experiment and see if it is can be used. Early mutations are overrepresented and in the small sampling you find the same mutation.